Our Quote of the Week reminds us that our technology and human advancements have made us more interconnected and sophisticated than ever before. In such a "seamless world," physical barriers such as border walls are not the ultimate solution for ensuring security. Rather, we must recognize our common existence as a precondition to creating a more secure world. In other words, it is only once we have addressed the human rights and dignity of all people that we can create the conditions for security. During a 1997 Address at the World Health Organization Conference in Jakarta, Indonesia, Sargent Shriver spoke about the links between physical health and economic security. Making connections between violence, poverty, poor health, and financial instability, he stressed that all sectors of society must work together to tackle these challenges so that we may ensure that children grow up in healthy, safe, environments. He also emphasized the need for international cooperation to tackle these issues, which would allow for broader, more creative explorations and solutions. 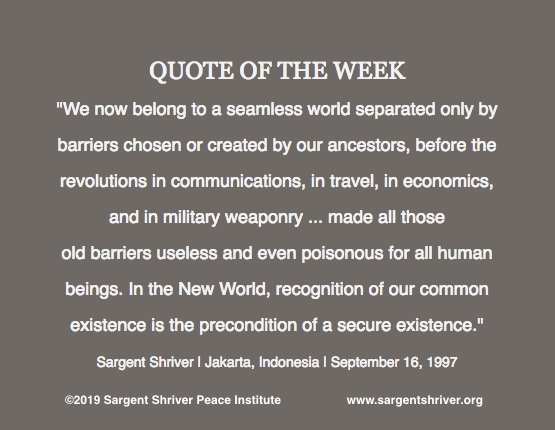 Over 20 years have passed since Sargent Shriver spoke these words, but they are particularly relevant at this moment. Sargent Shriver recognized that we had developed the tools to keep ourselves safe without an excessive reliance on physical barriers such as the one currently under discussion in the US, which has prompted a partial shutdown of the government. If we really want to be secure, we must foster stability and prosperity within our communities -- not dredge up fear and anger, nor deepen divisions. With stable environments and with the judicious use of communications and technology, we can build a more stable, prosperous future for all of us.